IMmerge » IMmerge 1.0 Beta 1 Released! IMmerge 1.0 Beta 1 Released! After a very long wait, I’m happy to release the first beta of IMmerge 1.0! This is the first public release with the new graphical user interface. If you have hesitated to use IMmerge in the past because of the command line, please give this one a try! Most of the features above have been discussed in a previous post. Don't recognize your friend's UIN? IMmerge makes it easy. Please keep in mind this is a beta version, so I recommend you make a backup of any files before you replace them. It’s been tested quite a bit, but there will always be something that I didn’t catch. There are also some known issues — so if you are insistent about having perfect logs, then I suggest keeping a backup handy. If you used versions of Trillian OLDER than 4.0 (including 0.74 — 3.1) in MORE THAN ONE timezone, and you run IMmerge on these logs, then you will get duplicates in your logs in the wrong timezone. 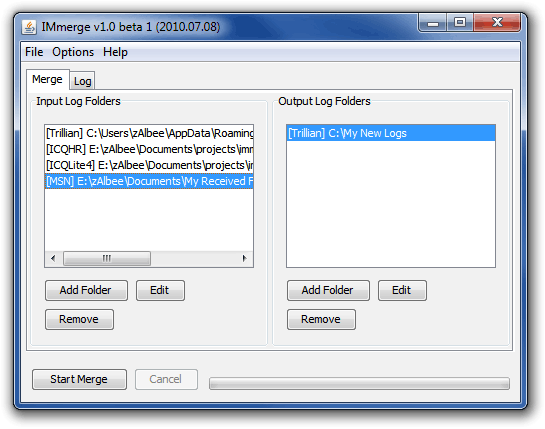 Logs from Trillian 4.0 beta (later than build 90, 2008-11-21), Trillian 4.0 FINAL and later are unaffected. This is due to a bug in older versions of Trillian, where timezone information is not logged. Note that only those sessions that differ from the Timezone setting in IMmerge will be duplicated (and only duplicated once). If you are OK with that, then go ahead, but do make a backup. Finally, feel free to leave your feedback and suggestions here in the comments, in the forum or by email. Thanks go to all the people who have emailed me in the past; you have definitely helped solve a great deal of bugs! the immerge 1.0 beta 1 works with Trillian 5 Beta? after the last the merge is Terminated by error. Thanks for the report. Let me take a look at it. Yes, for the log files, there may be lots of false positives for any line with a colon in it. It is not really possible to detect which ones are real without input from the user. Once an XML version is created though, it should stop asking.